A solution of sodium chloride and silver nitrate are taken separately in the two limbs of an ‘H’ shaped tube. The tube is sealed and weighed precisely. The two reactants are made to react by inverting the tube. The following reaction takes place. This law does not hold good when the compound is obtained by using different isotopes of the combining elements . 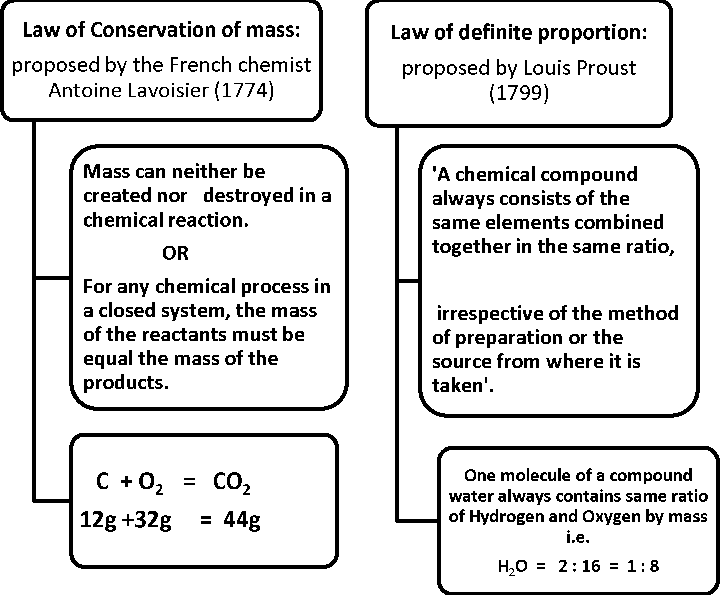 Q.1 Why chemical reactions are in accordance with the Law of conservation of mass? Q.2 Calculate the ratio of atoms present in 5 g of magnesium and 5 g of iron. Using his theory, Dalton rationalized the various laws of chemical combination which were in existence at that time. However, he assumed that the simplest compound of two elements must be binary. Q.1 In what respect does Dalton’s Atomic theory hold good even today? Q.2 Which of the following is not the postulate of Dalton’s Atomic theory of matter ? Each element is made up of extremely small particles called atoms. Atoms cannot be created nor destroyed. Compounds are formed by the chemical union of atoms of two or more elements in fixed proportion . An atom is the smallest particle of an element which can take part in a chemical reaction. It may or may not exist freely. The smallest particle of matter (element or compound) which can exist in a free state. Each atom of an element shows all the properties of the element. The properties of a substance are the properties of its molecules. MOLECULES OF ELEMENT: The molecules of an element are constituted by the same type of atoms. ATOMICITY : The number of atoms contained in a molecule of a substance (element or compound) is called its atomicity. Based upon atomicity molecules can be classified as follows. Diatomic molecules: H2 , O2, N2,Cl2, CO , HCl . Triatomic molecules: O3 ,CO2 , NO2. The abbreviation used to represent an element is generally the first letter in capital of the English name of element. Q.1 Give one example each of molecule of element & molecule of compound. Q.2 How does an atom differ from molecule ? Q.3 Name a triatomic gas. Q.4 Name the element represented by Hg, Pb, Au. Q.5 What is the difference between an atom of hydrogen and a molecule of hydrogen? Polyatomic Ion : A group of atoms carrying a charge is as polyatomic ion. Valency : The number of electrons which an atom can lose , gain or share to form a bond. It is the combining capacity of an atom of the element. ♦♦♦ Chemical Formula: A chemical formula is a short method of representing chemical elements and compounds. write the correct symbols of two elements. Criss-cross the valence and drop the algebraic sign. When the subscript is number 1, subscript is not written. RULE 3> When the valence of both elements are numerically equal , the subscripts are also not written. parentheses must be used to separate the polyatomic ion from the subscirpt. The Avogadro constant is named after the early nineteenth century Italian scientist Amedeo Avogadro. 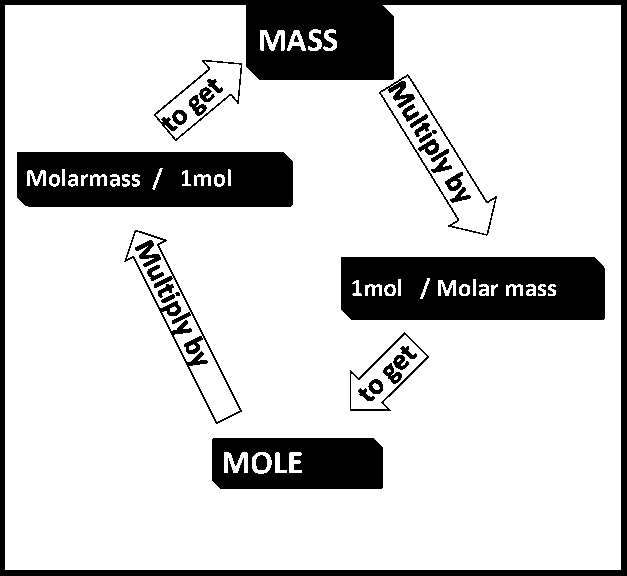 Gram molecular mass is the mass in grams of one mole of a molecular substance. Ex: The molecular mass of N2 is 28, so the gram molecular mass of N2 is 28 g.
An atomic mass unit or amu is one twelfth of the mass of an unbound atom of carbon-12. It is a unit of mass used to express atomic masses and molecular masses. Also Known As: Unified Atomic Mass Unit (u). MOLECULAR MASS : A number equal to the sum of the atomic masses of the atoms in a molecule. The molecular mass gives the mass of a molecule relative to that of the 12C atom, which is taken to have a mass of 12. Examples: The molecular mass of C2H6 is approximately 30 or [(2 x 12) + (6 x 1)]. Therefore the molecule is about 2.5 times as heavy as the 12C atom or about the same mass as the NO atom with a molecular mass of 30 or (14+16). Q.1 What term is used to represent the mass of 1 mole molecules of a substance? Q.2 What is the gram atomic mass of i) Hydrogen ii) oxygen ? Q.3 Calculate molar mass of C2H2. Ex: i) Convert 35 g of Al into mol. ii) How many grams of SiO2 are present in 0.8 mol ? Q.1 Calculate the mass of one atom of sodium? Q.2 The atomic mass of calcium is 40 u. What will be the number of calcium atoms in 0.4 u of calcium? Q.3 How many atoms of oxygen are present in 120 g of nitric acid ? Who gave law of conservation of mass ? What term is used to represent the mass of 1 mole molecules of a substance? 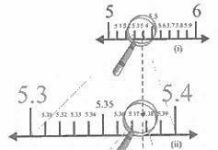 What name is given to the number 6.023 x 10 23 ? Give Latin names for sodium & mercury. *How many atoms are there in exactly 12 g of carbon ? How many atoms are present in H2SO4. Give the chemical symbols for the following elements: Gold, Copper , Potassium & Iron. Neon gas consists if single atoms , what mass of neon contain 6.022 x 1023 atoms. State the differences between an atom or a molecule. 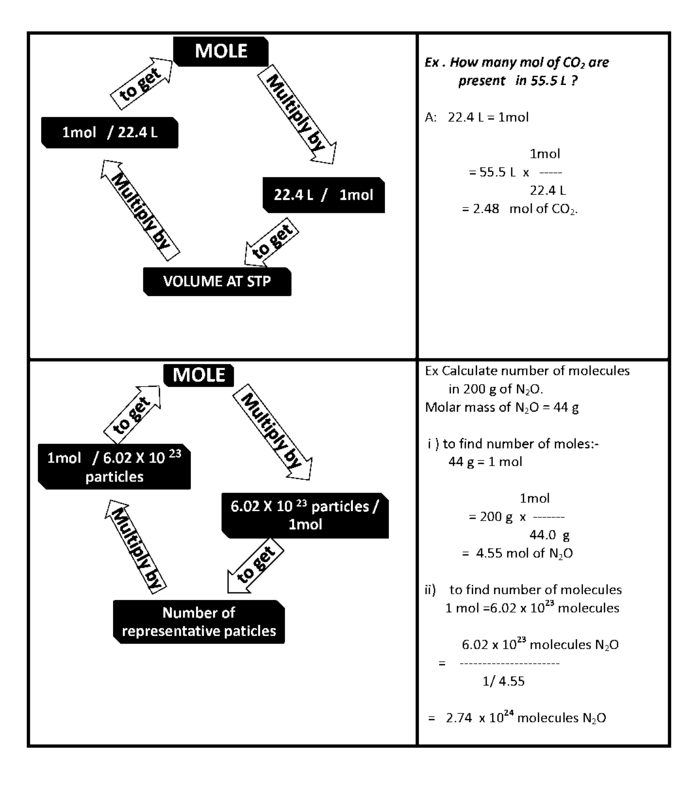 Molar Mass of water is 18 g mol-1 , what is the mass of 1 mole of water? . *The number of atoms in 1 mole of hydrogen is twice the number of atoms in one mole of helium. Why? 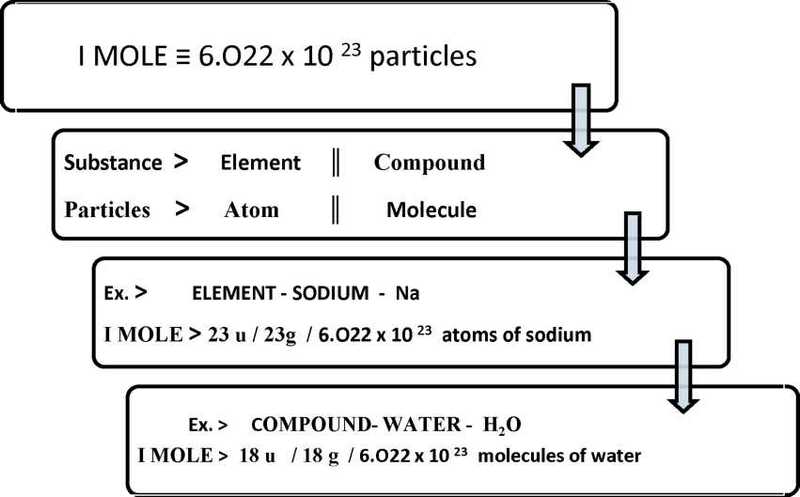 Calculate molar mass of H2O2 & HNO3. 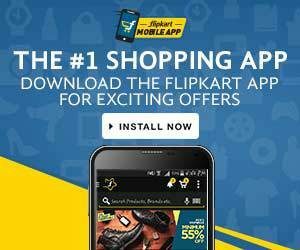 What is the mass of 0.2 moles of oxygen molecules? 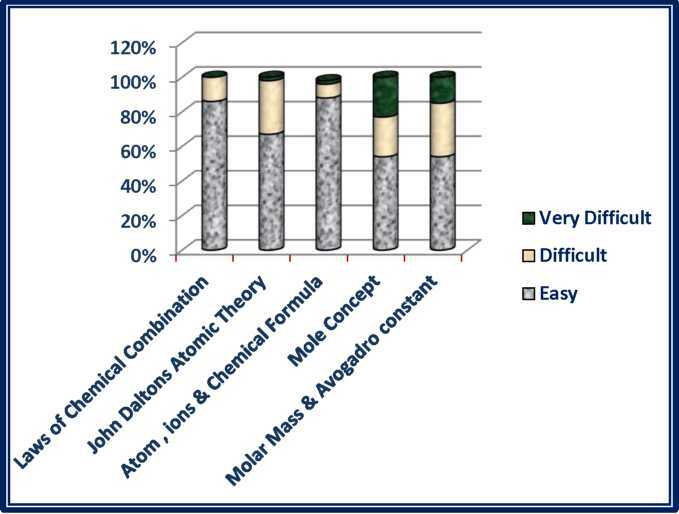 State the main postulates of John Dalton’s atomic theory. What are polyatomic ions ? 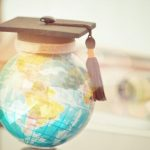 Give two examples. 1 mol of N atoms. ii) 4 mol of Al atoms. i) What is molecular formula ? State with example what information can be derived from a molecular formula . *	i) What is gram molecular mass? How many molecules are present in 34 g of ammonia ? Calculate the mass of 0.5 mole of sugar (C12H22O11). You Are expected to know..
John Dalton’s imagination about atom & the limitation of his theory. Difference between an atom & molecule. Writing chemical formula of compounds.